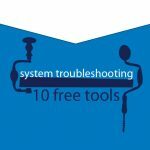 Here are 10 of the best free tools / packages for troubleshooting system issues. These tools should help you as an admin to fix the problem or identify the root cause more quickly. You can either use these tools yourself or provide them to a user who is experiencing the issue, for them to gather the information needed. This list is intended to supplement the list provided on 101 Free SysAdmin Tools and Top 5 Free Rescue Discs for Your SysAdmin Toolkit. Even if you may have heard of some of these tools before, I’m confident that you’ll find a gem or two among this list. Microsoft Easy Fix Solutions, formerly known as Microsoft Fix It, is a series of troubleshooting applications that target helping to resolve specific system issues. 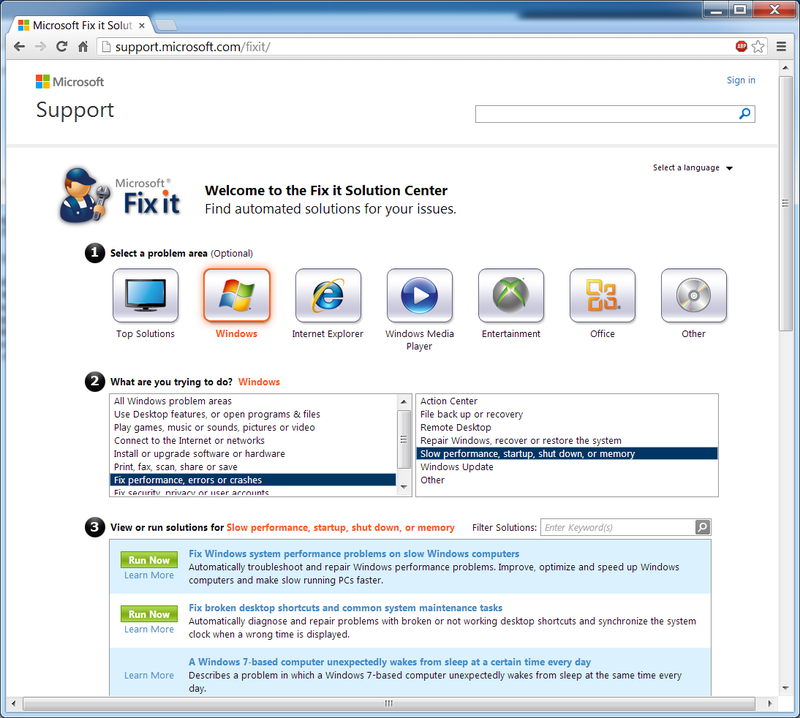 From the Microsoft Easy Fix Solutions home page, or from a Microsoft Support Knowledge Base article, you can download an executable to automatically fix the issue or be directed to a relevant walkthrough that explains what the cause and recommend workaround is based on your answers to troubleshooting questions. To use a Microsoft Easy Fix solution, navigate to the Easy Fix Solutions home page and choose which problem category you are trying to resolve from the list. A *.diagcab file will be downloaded. When you run the *.diagcab file, it will automatically attempt to identify and resolve the problem. Hidden away in Windows 7+ and Windows 2008+ is a neat little utility called Problem Steps Recorder (psr.exe). The Problem Steps Recorder will record the step-by-step interactions that occur while the user replicates the problem, taking screenshots of every action. It then bundles all this into a report with detailed information and any relevant error logs. This tool is great if you have a user in your environment who is experiencing an issue that you want to gain more information about and the steps they took to reproduce the problem, or if you want to create a report to send to a third party vendor as part of a support case. To launch the Problem Steps Recorder, go to the Start menu and type “psr.exe”. Click “Start Record” and the tool will record every interaction from then on. You can add comments during the recording process and then click “Stop Record” to save the report as an *.mht file within a zip archive. Windows Vista+ and 2008+ include a tool called Reliability Monitor. This tool provides an overview of overall system stability and details about events that can impact reliability. The idea is to pinpoint any troublesome areas and take steps to improve system reliability based on what you learn (e.g. you might identify a trend in a certain application crashing when opening a certain file type). 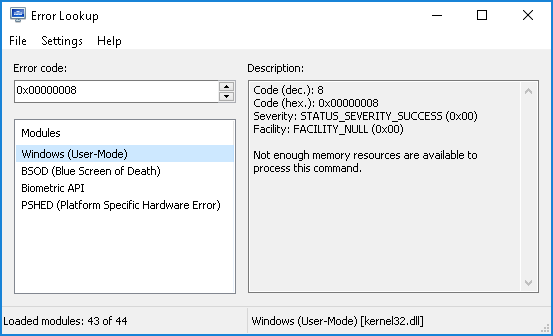 To run the Microsoft Reliability Monitor, go to the Start menu and type ‘Reliability’. This will bring up a “View reliability history” shortcut. Clicking on this shortcut will launch the Reliability Monitor directly. You can also launch this tool from the Performance Monitor tool by right clicking on Monitoring Tools and selecting “View system reliability”. Start by selecting whether you want to view information by Days or Weeks, and then click on a specific area within the graph to view information in the bottom hand pane. Once you’ve viewed reliability history for a specified period, you can choose to save the information to a file, view a list of all problem reports and check for solutions to problems. 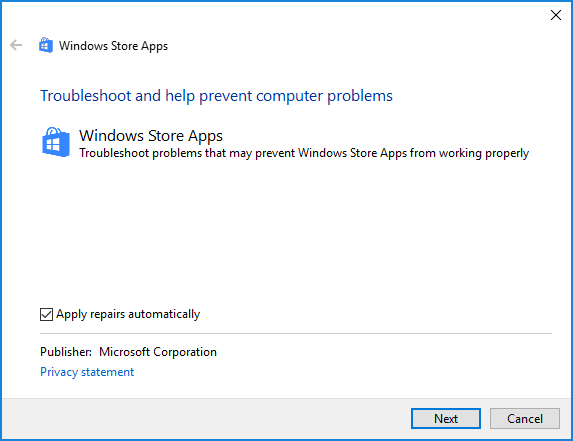 When troubleshooting issues, you might come across error codes such as Win32, HRESULT, NTSTATUS, BSOD, or HTTP and quickly need to find out what the error code means in plain English and what it relates to. This is where Henrypp Error Lookup comes in. Simply copy/paste or type your error code in and it will bring up a description for the error and the modules that are associated with it. Note: To supplement Henrypp Error Lookup, you can also use a similar tool called Windows Error Lookup Tool (WELT). As I mentioned in my article entitled Windows PowerShell™: Essential Admin Scripts (Part 1) the PowerShell Troubleshooting Packs (bundled with Windows 7/2008 and above) can be really handy when troubleshooting system issues. As such, they are a collection of PowerShell scripts that you can use to diagnose different aspects of your servers, clients or network. Different packages are available to troubleshoot printers, networks, performance, power, Windows Update, etc. As part of the troubleshooting process, it is helpful to know as much information as you can about the machine where the problem resides to assist in finding a solution more quickly. 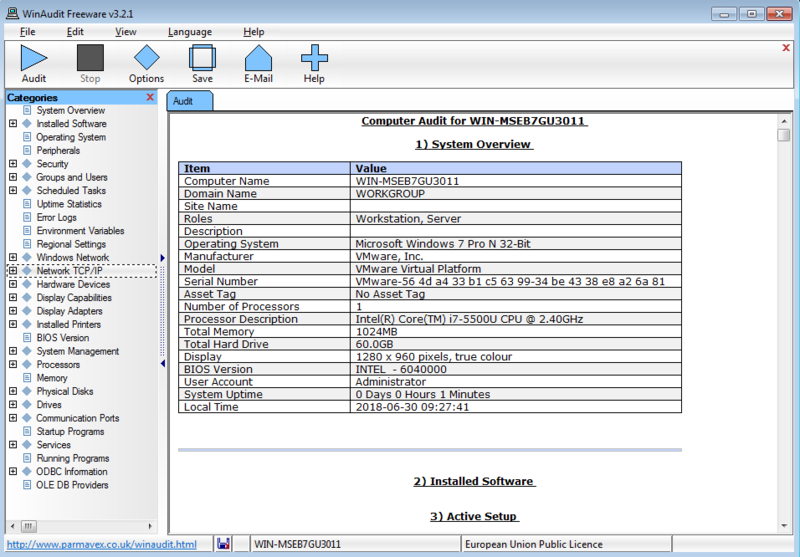 WinAudit scans your computer and gathers a whole raft of information about Installed Software, TCP/IP settings, Drives, Error Logs, etc. 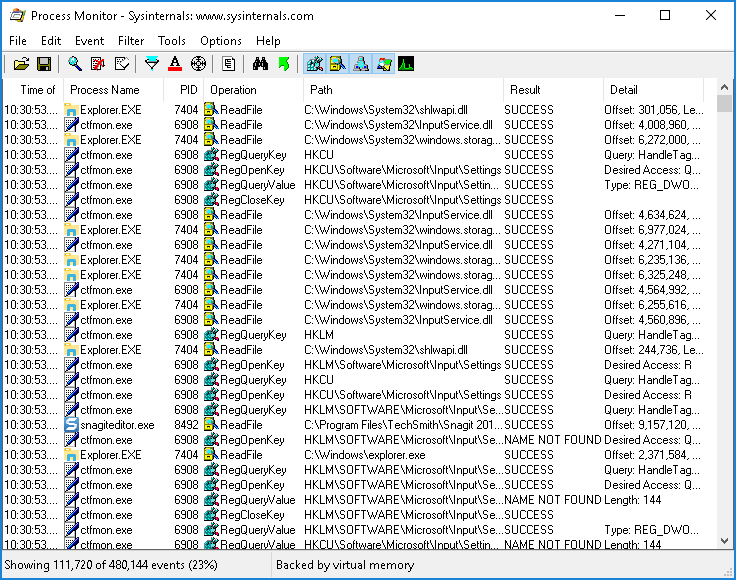 To start an audit of your local machine, simply execute WinAudit.exe to start the application and then click the “Audit” icon in the top left hand corner. Once the audit is complete, you can start to review the information from the different categories in the left hand pane, or save the information as a PDF / CSV / TXT / HTML file. Joeware Utilities are a list of free troubleshooting and system information utilities aimed at making the life of an administrator easier. These tools are built by a system administrator from his own experience of not finding a tool out there that did the job he needed for whatever he was trying to solve. 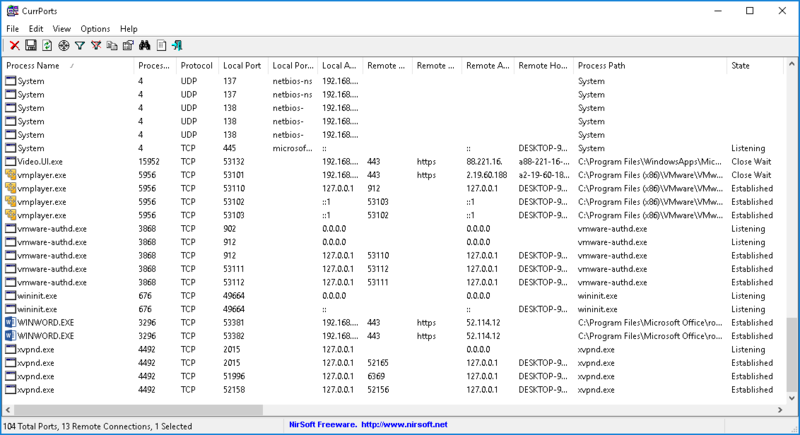 The tools available include anything from tools that dump user information from Active Directory, modify a user account’s expiration flag or perform TCP/IP port connection testing. Note: Unfortunately Joeware Utilities do not come as a bundled package and will have to be downloaded individually from the website. However, using a small add-on for the NirLauncher application mention below, you can download and categorize the tools ready to be launched from the NirLauncher application itself. SidToName is a command line tool that resolves SIDs (Security Identifiers) to friendly display names. You provide it with a valid SID and it returns the object name associated with that SID. AccExp is a command line tool that you can use to modify or read the expiration date of local user accounts. 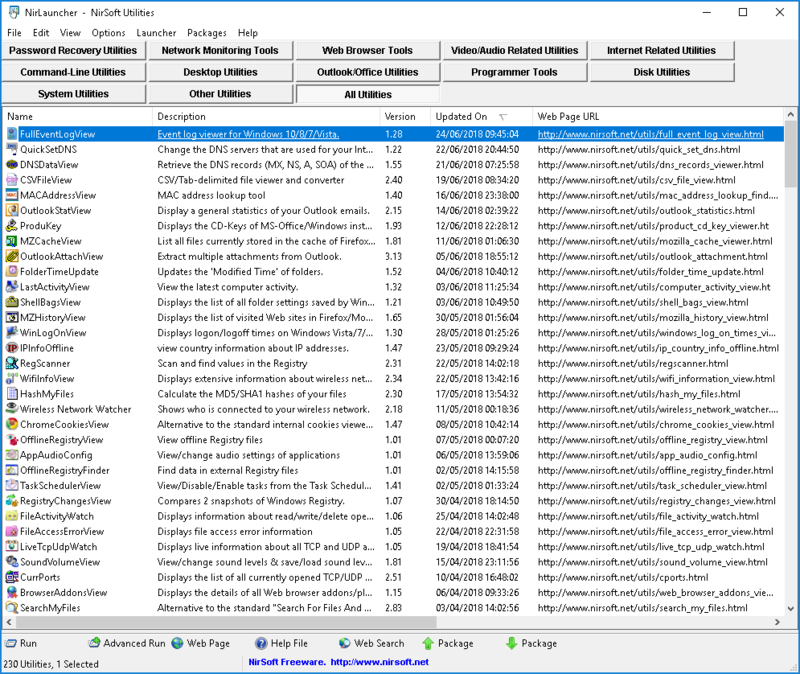 NirLauncher is an application that bundles more than 200 portable freeware utilities. The tools available include password recovery tools, Internet tools, programming tools, and system tools – all of which can be used for troubleshooting and information gathering. USBDeview is a small application that lists all current and previously connected USB devices on a local or remote machine. USB device information includes device name/description, device type, serial number, the date/time that the device was added or last used, VendorID, etc. CurrPorts displays a list of all currently open TCP/UDP ports on the local machine. Information about which process opened the port, the time the process was created and the user that created it is displayed. Using CurrPorts you can also close open connections and export the information to a file. 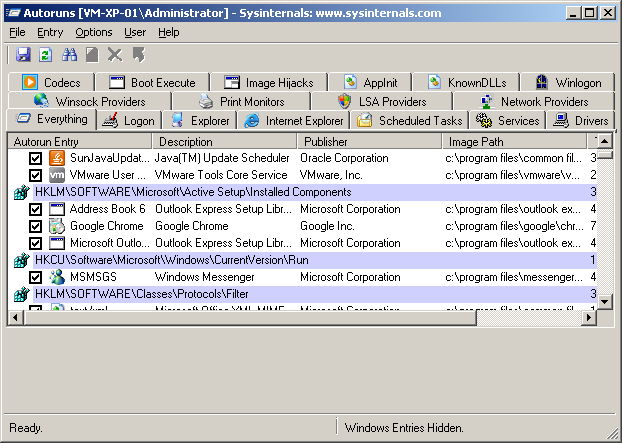 Using LastActivityView you can see what actions were taken by a user and what events occurred on the machine. Any activities such as running an executable file, opening a file/folder from Explorer or performing a software installation will be logged. The information can be exported to a CSV / XML / HTML file. 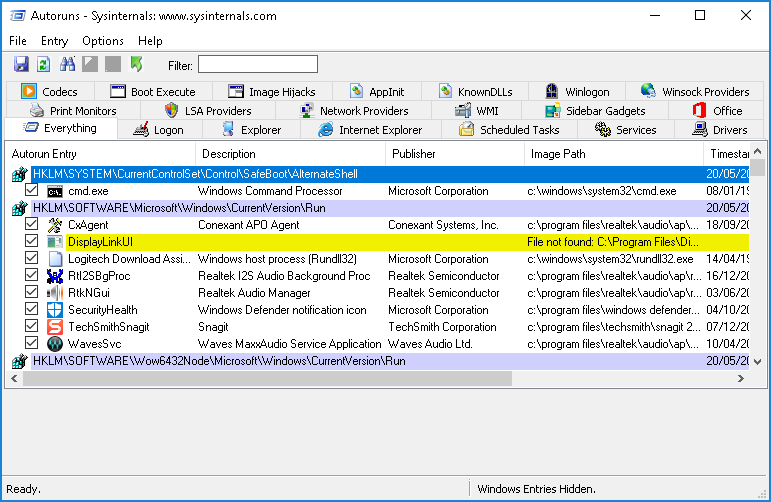 Microsoft SysInternals Suite is a collection of over 60 lightweight troubleshooting tools all bundled into a single download package. Whatever issue you’re trying to tackle, you are sure to find a tool in this package to help you manage, troubleshoot and diagnose your systems and applications. 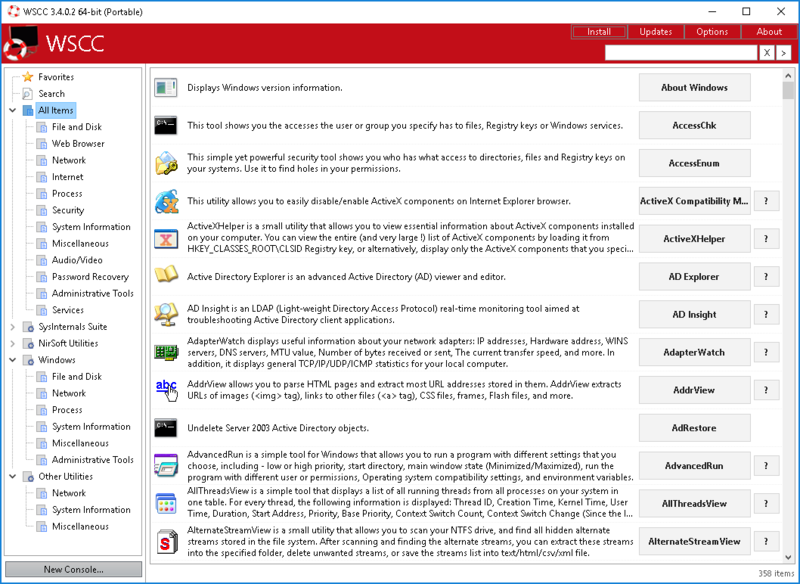 Autoruns allows you to view which programs and services are configured to run at system boot up or login, in the order in which Windows processes them. Using Process Monitor you can troubleshoot application and system related issues by monitoring activity related to processes, threads, DLLs, the registry and file system in real-time. 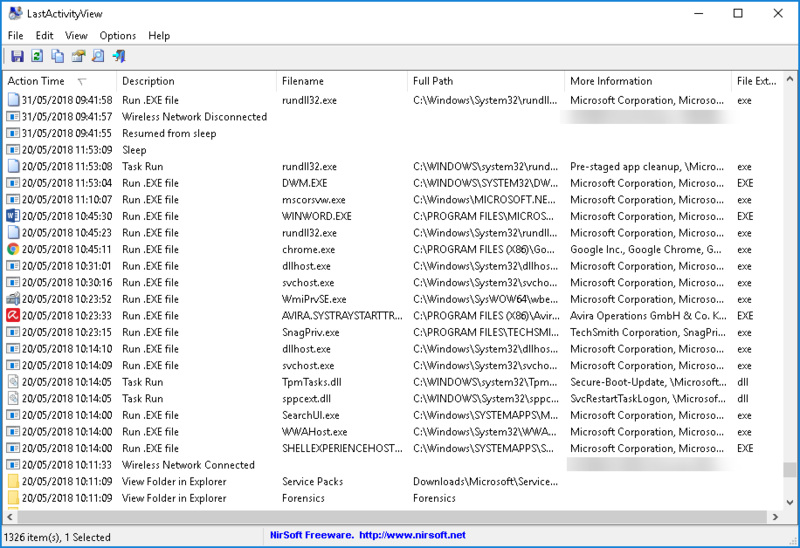 Using AccessEnum you can quickly view permissions of file system directories or registry keys and then save the results to a text file and compare results with a previously saved log. 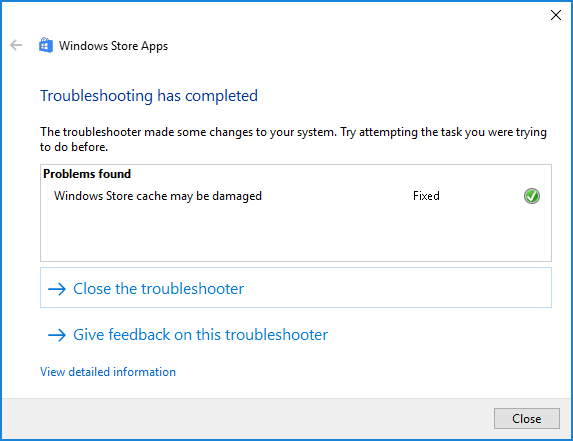 WSCC is not a troubleshooting tool per se, but it does facilitate issue troubleshooting by acting as an inventory for various system troubleshooting tool suites (such as those from Microsoft SysInternals and NirSoft). It allows you to install, update, execute and categorize the entire collection of tools in a single location. When you launch WSCC for the first time, you are given the option to download and install the latest versions of the entire set of over 300 tools. If you choose not to install them locally, WSCC will download each application when you first click on it and store the file in a temp folder within the WSCC directory. To launch a troubleshooting tool, choose a tool from the category within the navigation pane on the left hand side. You can also add favourite tools to the Favourites folder or search for a utility by name. Are there any free tools not on this list that you’ve found useful and would like to share with the community? Are these tools good for small busineses which cann’t hire a sysadmin at all? i am trying to use the tool Anturis which have been developed to use for non-specialists, but what about your tools? 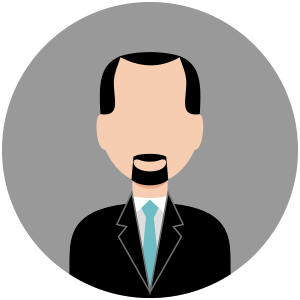 Could you explain what are the CASE Tools that could be used by System Administrator? Can These be accounted as CASE Tools? Well summarized collection of some decent options out there.. Thanks.